Realizing our news site could serve our service men and women as a venue to keep up with local news in their communities; FYN has created this page to honor our brave military. So beginning today, Armed Forces Day, and going forward we will provide this page to continually honor our United States Military Forces. May God Bless and watch over them all. Armed Forces Day is on May 21, 2011. This is a day for Americans to celebrate the five branches of the Armed services that serve our country. The first Armed Forces Days was on August 31, 1949, before that, each branch of the United State Armed Forces celebrated their own day. Another holiday that celebrates the military is Memorial Day. Memorial Day falls on the fourth Monday in May and usually gets much celebration. Many Americans may not be aware of Armed Forces Day. 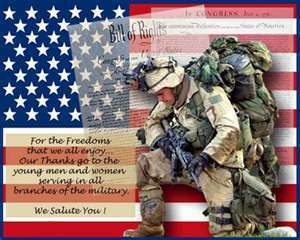 Fetchyournews.com wishes to thank all of our brave service people who now serve or have ever served our Country. We want to express a sincere thank you for your service and keeping it safe for us all to lay our heads down each night.